PRGF (PLASMA RICH IN GROWTH FACTOR) is a fantastic new skin treatment used to repair the damage to skin caused by ageing , sun damage and acne scaring using the bodies own ability to heal itself. The patients own plasma , rich in growth factor is used making the procedure 100% safe. The procedure is both CE approved and FDA approved. The results in repairing damaged skin are astonishing. The treatment consists of 3 appointments over a 3 month period. After that only 1 session is required every year. A small amount of blood is taken from the patient and the plasma is separated using advanced centrifuge technology. The plasma is re- injected into the skin in multiple tiny shallow micro-injections using advance automatic injection technology. PRGF treatment is also used in many other areas of dentistry and medicine such as extraction site healing, dental implant placement, bone regeneration, TMJ disorders, peridodontal pocket regeneration , wound healing and many others. 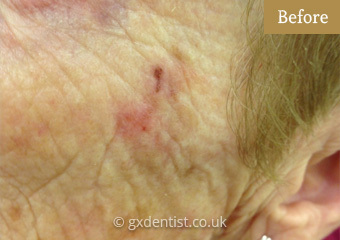 This patient had a long-standing (longer than 5 years) sun-damaged skin ulcer. She was 82 years old and had tried 'everything' to heal the area, with her GP advising her that no treatment was required. 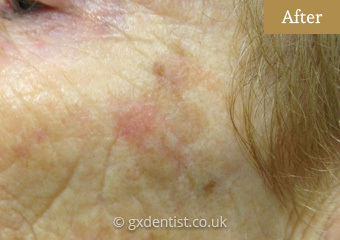 After 3 PRGF treatments spread over a 3 month period, notice also the general improvement of the patients skin. The patient reports that her skin now appears 'clearer and brighter'.